What is better than a bundle of joy as a new parent? Well, of course, it is two bundles of joy! However, traveling with two little ones is not that easy. If you are a parent of twins or have an infant and a toddler, you need to have double the baby care equipment. Don’t worry! We have got you covered. A Tandem Stroller should be on the top of your shopping list, as it can help you take your precious babies along with you wherever you go. They are strollers that are built for carrying twin babies or an infant and a toddler together. Let us walk you through the features of the best tandem strollers that you can buy for your lovely babies. The Delta LX Side by Side Tandem Stroller is one of the best rated in the market which helps in carrying your babies in style, without having the curse of being bulky and too heavy. It has a lightweight frame that can fit into a standard 30-inch wide doorway with shock absorbent front wheels to add to the perfect mix. The side-by-side arrangement gives better comfort to the baby. It has a multi-position reclining feature, comfortable shoulder pads and a 5-point harness. It also has a compact umbrella fold with a built-in cup holder and high capacity storage bags! Wait, there is more! The stroller can hold an infant or a toddler of up to 35 pounds on each seat. This stroller is JPMA certified and meets all ASTM and CPSC standards. In simpler words, this stroller has been verified to be safe by experts who test strollers for a living! 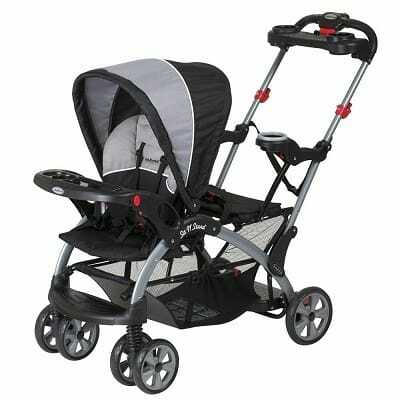 You will like this stroller because it is light-weight, folds nicely into a compact shape, and is also very affordable. 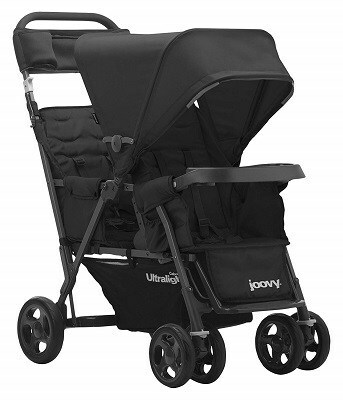 JOOVY is one of the most reliable brands when it comes to baby care equipment like strollers. All the products from the JOOVY label have unmatched quality with a lot of smart features and unbeatable price, and this stroller is no exception to this. The front seat accommodates the infant from the age of 3 months and up to 45 lbs. The removable rear seat can hold toddlers from up to six months and up to 45 lbs. The stroller can take a maximum combined child weight of 90 lbs. Both the seats have a multi-position recline and have a full-coverage canopy. The parking brakes and good quality suspensions make sure that you are your babies have a smooth ride. 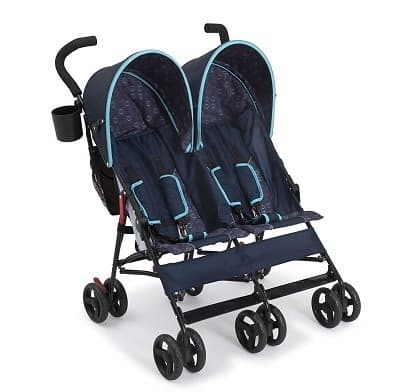 This is one of the best tandem double strollers in the market with a removable back seat. Available at a very reasonable price, it is a steal! 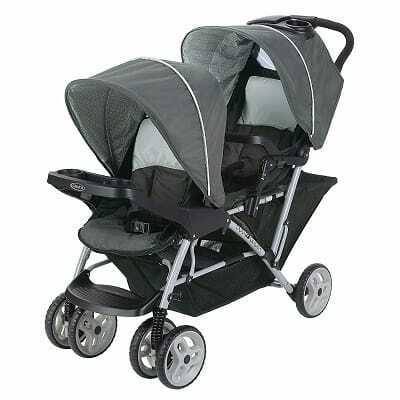 The DuoGlider is one of the best twin strollers with car seats included that you can find in the market at present. Graco is committed to the idea of making the experience as comfy as possible for the parent as it is for the babies. With reclining seats, rotating canopy, footrest and a child’s tray for the babies and a one-hand fold, a complete parents’ tray and a storage basket with a large capacity, it stands true to its word by making the experience more straightforward for the parents as well. The whole set is completed with the twin car seats and strollers along with them. They can be easily removed and washed in cold water with soap and dried in the sun. This stroller has individual trays and canopies for each baby, extra-large storage space, trays for parents, one hand standing fold keeping one hand free for the babies and much more. These are just some of the features that you can get at an affordable price with the DuoGlider from Graco. 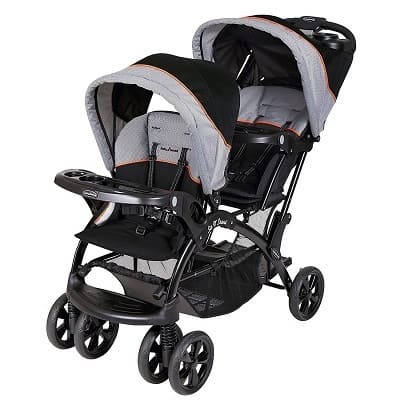 European style canopies to keep your kids away from the harmful sunlight and reflective piping on the accents to make your babies and you stand out in the crowd are some of the best features of this fantastic double stroller. Excellent front and back wheels with a great suspension ensure good maneuverability as well. This beautifully designed stroller has a compact structure and is lightweight, which ensures that you get a lot of value for every penny that you pay for it. With a lightweight design, excellent maneuverability and excellent storage capacity at an unbelievably low price, it is easy to list down what you will love about this double stroller! This unique design for double stroller boasts of multiple riding positions for the babies while strolling. Both the babies can be either sitting or one sitting and one standing on the stroller. This fantastic stroller also boasts of top-notch materials like imported Nylon and metal frame, giving it an irresistible appeal. Moreover, the foot activated brake ensures safety. 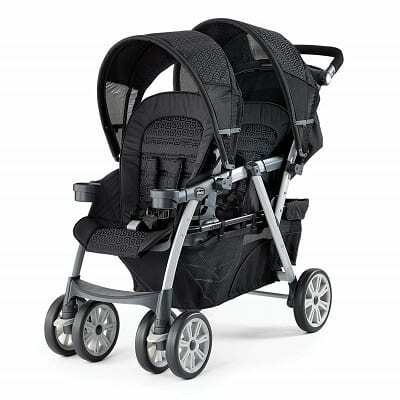 The ample amount of storage space offered also adds towards making this stroller an attractive deal. Although it looks very bulky and heavy, the stroller is surprisingly lightweight and can carry weights up to 50 lbs easily. This stroller promises all the quality and elegance in design than a Delta branded double stroller ensures. Be it plenty of accessible storage, cup holder for parents, five-point harnesses for the safety of babies or stylish side by side design – the LX double stroller by Delta offers it all. Like other Delta designs, the lightweight and sleek design at a very affordable price are what you will like the most about this stroller from Delta. 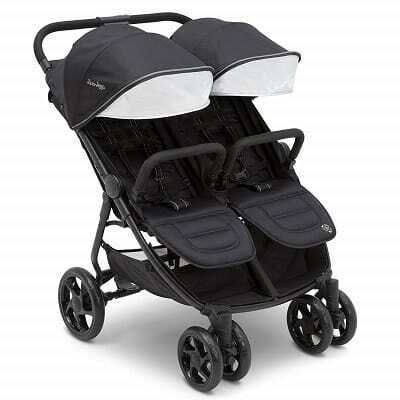 The Chicco Cortina is one of the chic and customizable double strollers in the market today. It allows a car seat to fit by the front seat inclining forward and the rear seat reclining backward – all this without installing any external adapters. It also offers removable canopies to accommodate older toddlers with ease. The storage basket also removes the general pain of using it by providing a rear zip to put things in and take things out of it easily. Overall, the Chicco Cortina has been designed to suit smart parents like you and your cute babies. The classy look, the rich features, and the comfort that this stroller offers at an affordable price are what make it immensely likable. Wherever you go with your babies, you should turn some heads. This baby stroller ensures just that! This double sit and stand stroller offers everything that a perfect tandem stroller should provide and much more. The double stroller has excellent storage space, both sitting and standing options for the rear seat, removable canopies to provide protection from the sun and a large under the seat storage basket to keep anything and everything that you need when you are out with your bundles of joy. Moreover, it has an organizer for parents that keeps all small things that come in handy for you in a systematic manner. What is most likable about this piece is the sleek design and excellent capacity that Baby Trend offers at a very reasonable price. 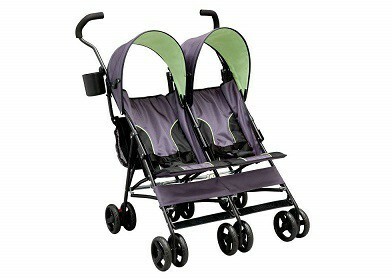 Now that you know which ones are the top tandem strollers in the market go ahead and buy one of these for your twins! This way, your babies will be carried around comfortably.